All students will be required to keep a journal. 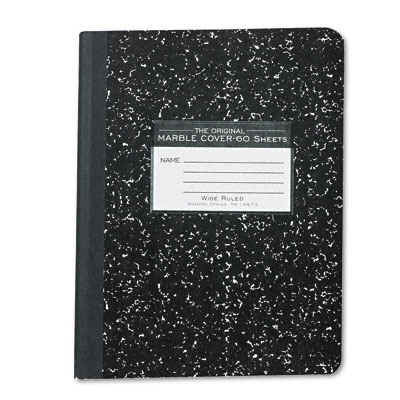 It should be a bound composition book as shown above. Spiral bound notebooks are not acceptable. Daily Objectives: This are our work goals. If we do not finish them in class, use this list to direct your homework and study. Key Vocabulary: Copy both the words and the definitions on the side board. Take extra notes as I explain if you don't understand the words. Journal Prompt: Usually a review problem to get the brain shifted into thinking about Science. Sometimes a brain teaser, or I may just want to hear your opinion. Start each day at the top of a new page. Any extra space on a page can be used for writing questions that you may have. It can also serve as a place to record raw lab data like masses, temperature etc. Make sure your entries are legible. Grading will be based on completeness, neatness and effort. Know that volume is measured in liters, mass in kilograms, length in meters. Know the prefixes of metric system that correspond to King Henry Doesn't like drinking chocolate milk. Homework worksheet due next class. Key vocabulary: Convert: in science class to change units from one unit to another unit by multiplying or by moving the decimal the correct number of spaces. 1000 grams is 1 kg. 100 kg = 100,000 g.
Bring your journal every day. If you forget it you must copy the day's entry from a friend. You do not have to write out the question, but if not, you must answer in complete sentences. If you are absent. Simply put the date and the word absent. You will receive full credit. Write your name legibly on the front cover! You may recognize your journal, but it will probably take me a while to do so. Like most things in life, you will get out of this exercise what you put in it. Your journal is designed to help you succeed.